If you can remember, Google displayed a Paper Planes interactive map at the Google I/O keynote before the actual presentation began. Users in the audience could catch and throw paper planes, with the planes themselves flying all across the world. If you need a refresher, this is what it looked like at I/O. The demo is now available on the Google Play Store for anyone to try out, published by the developer, Active Theory. Once you install the app, you can stamp planes with your location and throw them out into the world for someone else to receive. 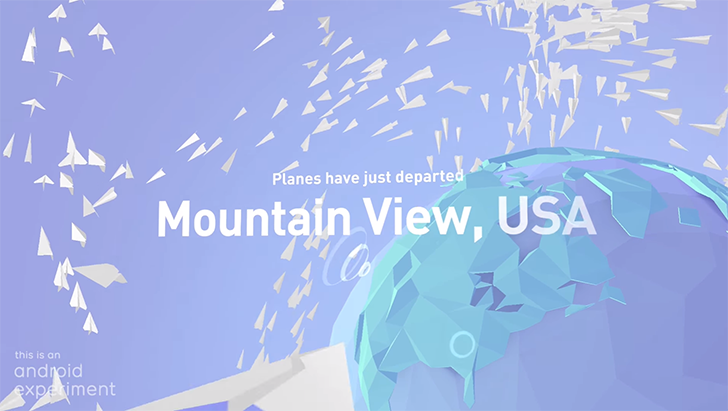 It is much more fun when you visit paperplanes.world in your web browser - you can actually see your plane being thrown (without syncing anything). The website uses WebGL, so it should work without issues on modern browsers. If you are interested in the development side of the app, I highly recommend checking out the source link for all the details. If you just want to fly virtual paper planes, you can download the app for free from the Play Store below, or from APKMirror.